Can visions of treats entice a porcine wonder to wear her princess costume? Hold on for some Halloween havoc, Mercy Watson-style! When the Watsons decide to zip their porcine wonder into a formfitting princess dress for Halloween—complete with tiara—they are certain that Mercy will be beautiful beyond compare. Mercy is equally certain she likes the sound of trick-or-treating and can picture piles of buttered toast already. As for the Lincoln Sisters next door, how could they know that their cat would lead them all on a Halloween "parade" of hysterical proportions? Kate DiCamillo’s beguiling pig is back in a tale full of treats, tricky turns, hijinks, and high humor. 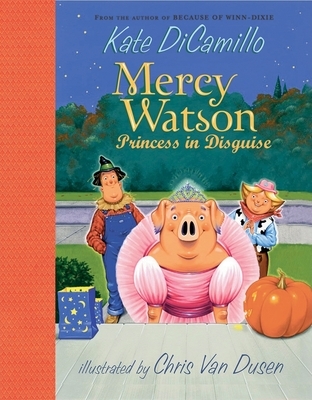 Kate DiCamillo is the author of the first three stories starring Mercy Watson. She is also the author of THE TALE OF DESPEREAUX, which won the Newbery Medal; BECAUSE OF WINN-DIXIE, which received a Newbery Honor; THE TIGER RISING, a National Book Award Finalist; and THE MIRACULOUS JOURNEY OF EDWARD TULANE, winner of a BOSTON GLOBE-HORN BOOK Award. She lives in Minneapolis. As always, the Watsons' enthusiasm for their porcine marvel is both hysterical and heartwarming. There is something reassuring about the way they regard Mercy: She is beautiful. She is wonderful. She is adored. Which actually sums up the way I feel about Kate DiCamillo’s series. Kate DiCamillo's porcine heroine returns…once again all's well that ends with buttered toast. The humorous tone and simple sentences will appeal to young readers, as will Chris Van Dusen’s energetic gouache paintings. How can you go wrong with a pig in a pink tutu and tiara? There’s a lot of silly fun in store for readers. Learning-to-read kids will appreciate Chris Van Dusen’s dynamic illustrations that are interspersed throughout the text. The brilliantly colored illustrations by Chris Van Dusen pack a comical punch. The hilarious colored paintings, packed with action and emotion, add momentum to the pandemonium in this perfect beginning chapter book for second-graders. An irresistible reading romp with lightning-fast action and sparkling slapstick illustrations.